This post was written by Global Post's Iran Correspondent. Author cannot be identified because of Iran's press restrictions. On the eve of Feb. 14, the day the opposition in Iran had planned a rally in support of the uprising in Egypt, Dariush was restless. "I am anxious," the student of photography at Tehran University wrote on his Facebook wall. "What will happen tomorrow?" Twenty-four hours later, he wrote again. Comments from his friends started pouring in, all with a sigh of relief. Dariush began a flurry of posts, writing with palpable emotion about what he'd seen that day. He wrote about trash cans being set on fire and seeing three plain-clothes officers beat a young woman with electric batons, cheering each other on. "Nothing's more painful than watching women get beaten," he wrote. 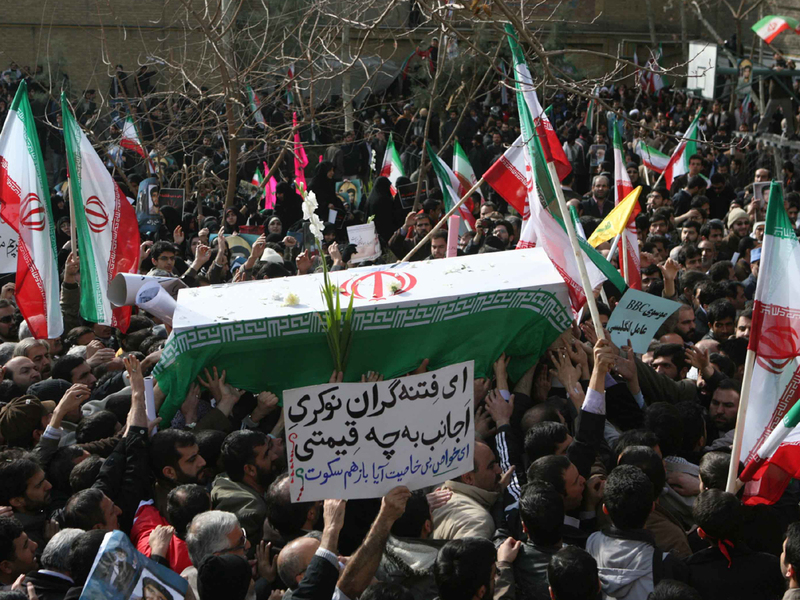 Dariush was one of thousands of Iranians who put their lives on the line Monday. After a year-long absence, protesters took to the streets, ostensibly to throw their weight behind uprisings in Tunisia and Egypt. The Iranian opposition hoped to breathe new life into the resistance movement that started with contested presidential elections in June 2009. In Tunisia and Egypt, demonstrators stayed out on the streets until they saw results -- Tunisian President Zine El Abidine Ben Ali fled wide-ranging protests on Jan. 14, and the military ushered Egyptian President Hosni Mubarak out of office on Feb. 11. Though the situation in Iran is unique, the voice of the opposition there is starting to speak of the same desires in its own country. "What happened in Egypt and Tunisia created a new state of mind in Iran," Saeed Paivandi, an Iran expert and professor of sociology at University of Paris 8, told GlobalPost. "They raised expectations. It proved that even the most despotic leaders in the Middle East could be overthrown." "If 10 years ago Iranian leaders could tell people Iran is one the most democratic countries in the Middle East, it might have worked," Paivandi added. "Today, it will not. Iranians feel they are falling behind, and that is a bittersweet feeling for them." Fearful of this sentiment, the Iranian government has tried to downplay the uprisings spreading across the Middle East, dismissing them as an "Islamic awakening" that was a reverberation of Iran's 1979 Islamic Revolution. But that didn't stop the demonstrators, who turned out in droves on Monday. What started as a peaceful march on soon turned violent as protesters clashed with security forces. Two people were killed, according to reports. On Tuesday, Iran's parliament went a step further to quash unrest, calling for the two most prominent opposition leaders -- Mir Hussein Mousavi and Mehdi Karoubi -- to be put to death. "I find it ironic," Obama said, "that you've got the Iranian regime pretending to celebrate what happened in Egypt when in fact they have acted in direct contrast to what happened in Egypt by gunning down and beating a people who are trying to express themselves peacefully in Iran." According to some, Monday's protests sent a clear message to Iranian leaders: The opposition movement will only be satisfied by a major change in leadership. "When you hear slogans such as 'Mubarak, Ben Ali, Nobateh Seyyed Ali' [meaning it is now Khamenei's turn to go], this means that the movement wants the same results as what happened to those leaders," said a political analyst based in Tehran who wished to remain anonymous. "They don't want a reshape of what already exists." According to this analyst the Iranian government hasn't been doing itself any favors by cracking down so violently. "When they [Iranians] see an increase in arrests, imprisonments and executions, how do they think they would react?" he asked. On the other hand, professor Paivandi says he doesn't thinks things will pan out the way they did in Egypt -- at least not as quickly. There are major differences in the situations between the two countries. The most glaring difference, many say, is the level of brutality exhibited by the Iranian Basiji or security forces -- which includes ruthless executions and countless reports of beatings, arrests, torture and harassment -- as compared to the equivalent forces in Egypt, where protesters were ultimately permitted to defy curfew and stay out until Mubarak stepped down. There are other distinguishing factors, too -- like recent cuts in subsidies -- that should bolster the resistance movement, according to Paivandi, but will only do so gradually. "The abrupt changes in the economy, such as cutting subsidies, will help strengthen the Green Movement," he said. "If prior to these changes, the educated middle class and the rest of the factions in the opposition were not on the same page, as prices go up slowly, this becomes a unifying element," he said. The government of Iranian President Mahmoud Ahmadinejad unleashed major subsidy cuts last December that resulted in the dramatic increase in prices of gasoline, electricity, water and commodities, such as bread. Many in the opposition camp saw Monday's turnout as a victory. If nothing else, the protests proved the opposition leaders are still capable of gathering a crowd. "I salute you. The glorious demonstrations of February 14th, 2011, [which are] a great achievement for our nation and the Green Movement, took place despite the skepticism by many with the participation of male and female warriors representing all segments of our society." Mehdi Karoubi, the other major opposition leader who was also banned from the protests, issued a statement of his own: "We are ready to pay the price," read its final line. And protesters, like Dariush, are already looking ahead. "What next?" Dariush posted on Tuesday. "The same thing," replied one of his Facebook friends. "Yesterday was just the beginning."